Peter Diamond is a gem – Joyce's mystery and fiction book reviews with some non-fiction too! I have read all of the Peter Diamond mysteries. I was first attracted to them because of their Bath, England setting. Having lived in Bath, I was excited to visit fictionally. The books do not disappoint if you like traditional mysteries leavened with some humor. 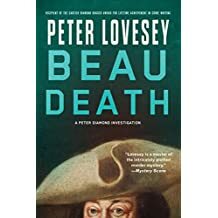 In this forthcoming entry, a body is found and questions arise as to whether the victim was Beau Nash, a famous historical figure. This is a fun and intriguing mystery with well developed characters and an interesting plot. Put it on your winter TBR list.